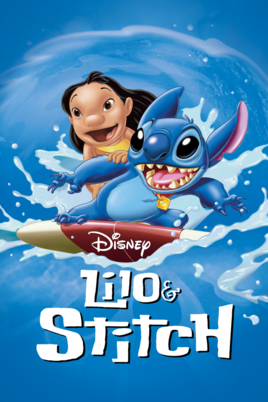 Lilo & Stitch is a 2002 traditionally animated (not-predominantly-computer-rendered) movie about a small Hawaiian girl named Lilo, orphaned by circumstance, her best friend and sort-of-dog Stitch, on the run from an intergalactic police force that want to arrest him for being Extremely Naughty. If you’ve never seen it before, that’s okay, it is ultimately a Disney movie for kids, but I love it to bits. Lilo’s big sister, Nani, is doing her best to raise her sister, who is both imaginative and weird and clearly pretty traumatised from losing their parents. Eventually the coping mechanisms to try and get their lives together include getting a dog, which brings Stitch into their life, an alien killing machine trying to hide from The Actually Pretty Legitimate In This Case Cops. Stitch is a horrible little goblin, but teaching him to be less of a horrible goblin teaches Lilo responsibility, and seeing how his horrible goblinosity makes life harder for Lilo teaches Stitch that he cares about doing right by them. 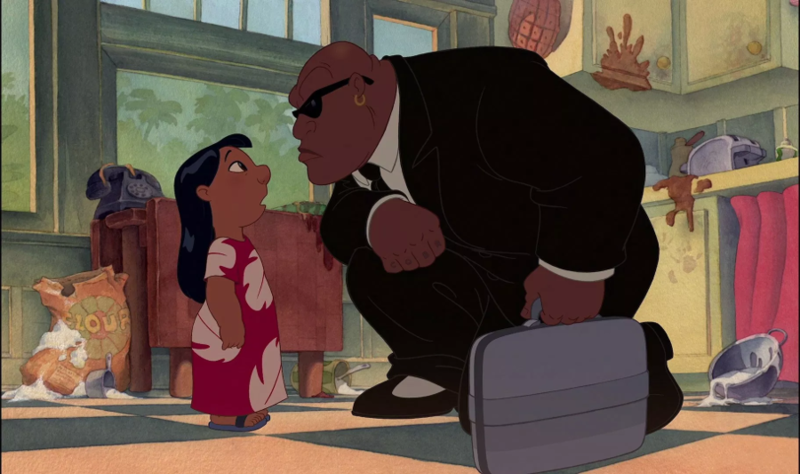 Then in the end, all the authorities at once are lined up to have this conversation about What’s To Be Done, and it’s resolved that the new status quo of Nani caring for Lilo & Stitch is good and to be accepted. That’s your fundamental story structure and it’s hard to talk about it without leaping off into all the exciting, excellent things this story does. First things first, everyone in this movie is great? While it’s full of one-liners, those one-liners are the kind that you can both remove from their context and be funny, but they’re also moments that are really solid for conveying character and story in their context. It’s weird, like they’re somehow both universally useful and yet extremely specifically situated. You can write dialogue like that but it isn’t easy. Lilo’s affect is really endearing despite the fact she’s a little kid. One of the things that really easily sets me off is twee renditions of children that are either too saccharine or too deliberately quirky, and Lilo lands in that spot between ‘withdrawn’ and ‘imaginative’ by skipping her personal characterisation squarely into ‘depressed.’ She’s clearly clever but not A Secret Genius clever, and her imagination ties into how she sees the world around her as having all sorts of interconnected invisible forces. She catastrophises, too, which is a common trait for kids with trauma to carry. It’s this thing where a problem can’t ever be seen as just a little problem (this annoys me), it has to have truly dire consequences. Catastrophisation is when you see every possible outcome of a mistake or situation as being really bad, which I’m sure some of you are now going: oh there’s a word for that. If you want an example, we get one in the opening seconds of the movie. Lilo is late to her class (a thing she wants to do) because she has to give a sandwich to a fish, named Pudge (and she has to give him peanut butter, because the alternative would be tuna, and tuna is a fish so she’d be bad for making Pudge eat fish). This whole outburst and task is all tied into her belief that Pudge controls the weather, which suggests that Lilo has some reason to want the weather to stay the way it is and not storm, which also suggests this is linked to a need to maintain control of the world around her. 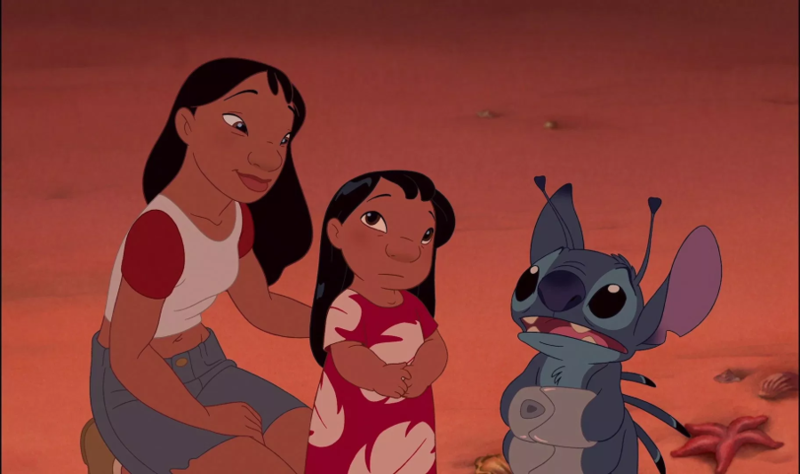 I feel like Lilo makes a lot of sense, and she shows a lot more of a parental loss and the ensuing tragedy than you normally do out of a lot of Disney heroines who’ve had to endure that. Most absent-parent stories they make touch on the death with a little bit of ‘oh, that’s sad,’ and we rarely get to see the way that being adrift like that can mess you up. Even The Lion King which traumatises the audience very directly with Mufasa’s death kind of diminishes that trauma on Simba. Something bad happened to Lilo’s parents, and as a result, she now wants to try and control everything. She sees magic everywhere, in one of the few Disney settings that isn’t magical. This does work to her advantage, though: her way of perceiving the world makes it easier for her to roll with the weirdness that the aliens bring. Trauma is woven throughout this movie – Nani is constantly at a frayed edge and has loud verbal outbursts in an attempt to cope with being a parent to a sister who is, also, again, traumatised. Stitch wants to respond to his primal urges, and can’t. Lilo is depressed, has catastrophic outbursts, and wants to control everything because she’s still nursing the trauma of losing her parents. The only thing they have left is one another, and it’s expressed with the arc word ohana. There’s a question at the root of these characters, which is Who are you. In almost every case, the character has a person they’re meant to be, and then the person they have to be given their circumstance. Lilo is meant to be a model kid, imaginative and happy, and not a traumatised, overreacting wreck. Nani is thirteen years older than her sister, she’s probably meant to be going to college or finding a way to start in the world supporting herself with her parents help, not supporting both of them at once. Stitch is made to destroy cities and ruin the world, and he’s stuck on an island without them. These are people who when presented with the question of who are you have no good answer. Most of the time, a Disney story is going to be about destiny, which is a great device to build your story around when you want to reassure kids watching it that things are pretty okay, and people in charge have your best interests in heart, and largely, everything will be okay. To use the archetypal princess or lost-princess story as the base, your main character is someone who was chosen before they were born, and no matter what they’re doing with their life, their destiny is waiting for them to walk along and get it. When you are destined, the only choice you have is when you accept your destiny. That’s not here in Lilo & Stitch. There is no obvious solution, no path forwards that will fix everything they have. Maybe if they let the powers outside themselves take control of their lives – the earth government and the alien Got A Point There Cops – they might have better lives, but it’s not Destiny. There’s no force guiding them towards it, nothing they’re entitled to if only anyone knows. In the end, what saves them is their interest in one another, and making the choice to stay together. Ohana is not magic, ohana is a choice. 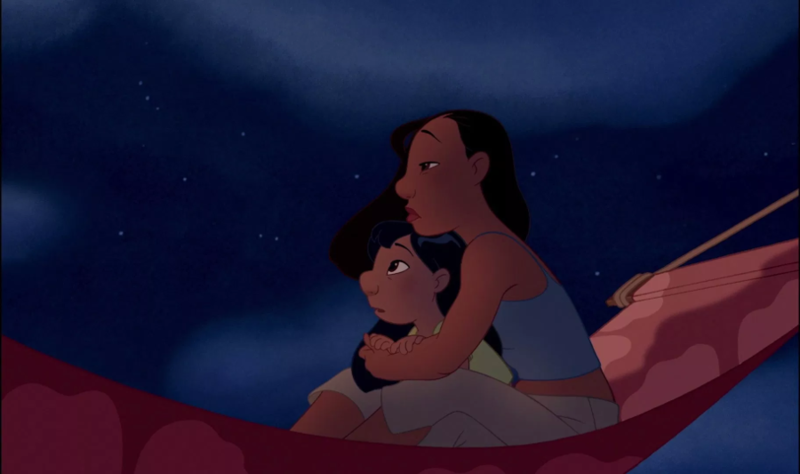 There’s also the heartrending moment where Nani sings to Lilo. It’s one of those songs that kind of just means ‘oh, yeah, Hawaii’ to outsiders. The song, Aloha Oe, is an incredibly important cultural song to Hawaii itself. Cartoons use it overwhelmingly to evoke ‘Hawaii-ish’ feelings. Heck, it’s almost a punchline itself, like you’ll hear in Spongebob Squarepants. This song was, the story goes, sung by Queen Lili‘uokalani. Some stories of it make it about a loving message to British people she was friends with, before they left. Complicating this connotation of the song is that, sometime after she originally performed it, Queen Lili‘uokalani was imprisoned in the coup that just coincidentally resulted in Hawaii going from being an independent country with its own resources and its own ability to refuse service to countries based on their own moral framework to being one of the United States, a decision that was made, no doubt, entirely impartially, and not at all in order to benefit the people with the big guns who happened to benefit from the eventual outcome. With this marked change, Aloha Oe shifted sharply in its cultural perception. — the song is known as an anthem to loss. It is a First Queen who was a Last Queen, singing from a prison cell, about the culture that was hers to care for, that granted her privilege and grace and comforts and in exchange ask that she navigate one of the most fraught points of their history, and how that was now no more. It is a happy, sunny song. It is also a song of ends. And it is this song that Nani sings to Lilo, on the night where she is afraid that Lilo is going to be taken from her, by the state. I don’t know if this was going to be meant to highlight this tension, between how Hawaiians perceive themselves or how other people perceive Hawaiians. There’s a tension of this vein that runs through the whole movie. The life Lilo and Nani leads is extremely chaotic and strange and when you look at it for a hot second, it can look like it’s out of control. But Cobra’s vision of their life is always made out of context. Nani lies to him because she’s trying to make sure she’s perceived as good to his standards of goodness. Similarly, the lesson Stitch learns is about how he sees himself – and how he doesn’t have to be the thing he’s been told he was made to be. This duality is driven deep in a deleted scene, where Lilo is shown interacting with a cloud of different American tourists that ask her the same question: What way is the beach. Lilo directs them in random directions, every time, and she does it with the tired, bored air of a girl who has done this a dozen times. She takes photographs of American tourists like they’re strange outsiders. and they treat her like she’s a prop to make their holiday More Interesting. This is what Nani evokes, the life of being an outsider under ownership, and losing something vast and fathomless, as she sings to her sister with their future uncertain. Obviously, I’m not Hawaiian, and this is still the product of Disney, the Most American Thing In The World, that wants to market its global hegemony of American-ness as somehow, in fact, the world culture of childhood. This isn’t some groundbreaking antiracist work that should be honoured and exulted as an example of how things are to be done. It’s more that when you know these things, there’s a dimension that you may have missed. At the end of this story, there’s the moment where Stitch speaks, most coherently, in his own defence. It’s a sharp shock considering how he fights thus far, that he literally is a monster in his own defence. When he’s captured, he quietly asks what he should do. Then he’s asked that crucial question from before: Who are you? This is my family. I found it all on my own. It’s little, and broken, but still good. Yeah – still good. I think sometimes this is the story that showed me that a family can be made and not just by hospital visits and biological field notes. Being broken and small is not bad. You can be okay with being okay. There’s that question of who you are and how we answer it with what we do, that question that stirs in the back of my mind time to time. Who am I, really? I know that my family, my family, wanted to make me into a man. Growing up I was taught a vision of history that meant you tried as hard as you could to be the best at something, and you might be the kind of great man whose skills just happened to align to turn the aims of God into reality. You had to be a man, and you had to be a Great Man. I’m not a very well person. Just in general. I don’t feel like the inside of my head is a very nice place. I don’t necessarily see myself in Stitch. 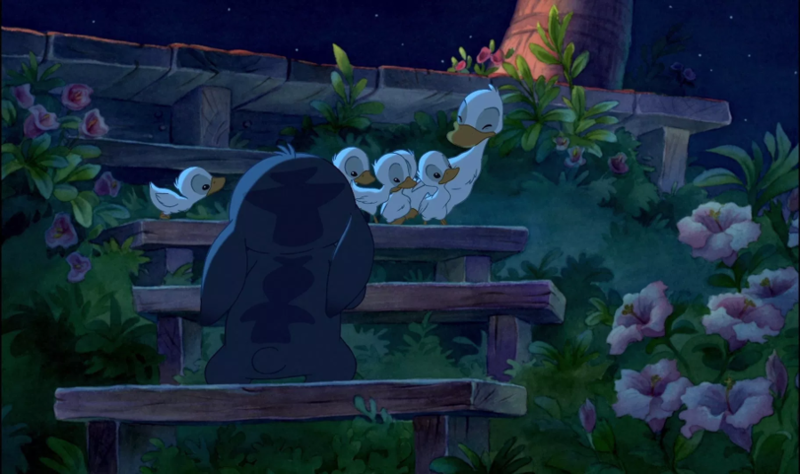 Stitch is also adorable, and he’s kind of allowed to have his moments, to lash out. 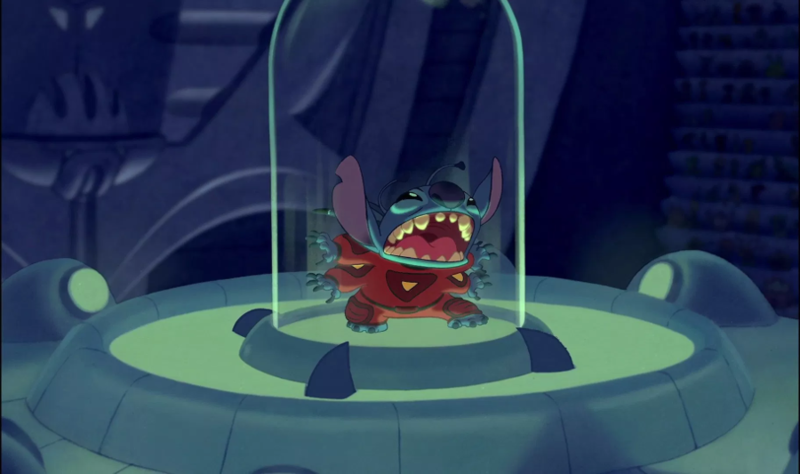 Stitch can shout that he’s cute and fluffy and he can hurt the villain and it’s okay, people know he’s on the right side. Stitch can be a hero. Still, I hold on to that thought, time to time. About who I am, about the kind of person I am, and the thing I’ve cobbled together out of my experiences. I am not a great man. At best, I am a pretty large boy.